For centuries, auctions were how art was traded among society's elite. In the first few decades of the 1900s, an emerging class of collectors and dealers began frequenting auctions that were small, private affairs attended primarily by those that fully understood the market. They were looking for work they could purchase at low costs for the sole purpose of reselling at a higher price. It wasn't until the 1970s that auctions entered the larger cultural consciousness and started to really have an impact on the contemporary art market. This was largely prompted by the record-breaking auction of Robert and Ethel Scull's renowned collection of Modern and Pop Art masterpieces in 1973. The fifty pieces in the auction included work by Jasper Johns, Rauschenberg, and Warhol, and brought in an enormous profit that had been unheard of at the time, ushering in accusations of profiteering and outcries about the commercialization of art, along with kicking off the auction market as we know it today. The '80s were particularly good for the art auctions, coinciding with the generally bustling economy and the trend of art collections being seen as hip status symbols. The major auction houses liquified the market by actively working to increase their client base and bringing auctions to the masses. 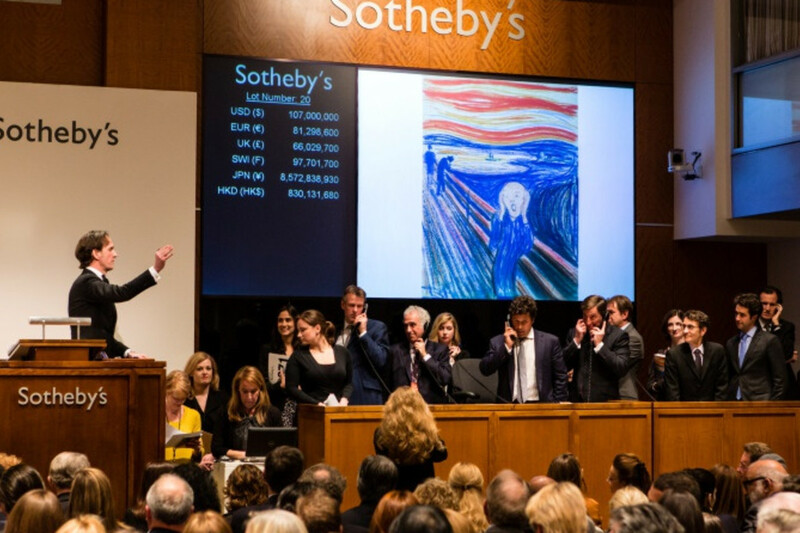 Sotheby's in particular was leading the way in changing the role of auction houses in the market, thanks to the company being bought by real estate developer, Albert Taubman. On the one hand, he established the Arcade auctions, which sold works at lower prices and drew in hundreds of new clients. On the other hand, he aggressively marketed toward the New Money of Wall Street, along with expanding their reach to global markets, like Japan, that had seemingly endless amounts of cash to spare. Suddenly, art was a hot commodity, and the auction world where people acquired it was the epitome of chic. Bidders transitioned from collectors and dealers to CEOs and socialites, the auctions becoming a place to see and be seen, and their purchases getting press on Page Six. Prices soared. The bubble burst in the early '90s, however, and the auction market tanked. But, since then, the importance of the market and the price of sales has been steadily increasing (with an expected dip during the Recession). Global players - particularly in Asia and the Middle East - are driving a lot of the jaw-dropping bidding that you'll see today, but it certainly isn't all lots that sell in the millions. A beginner collector can definitely find their place in the auction market. Bought-in: When a lot does not have any bids, or the bids aren't high enough to reach the reserve price (see below), the lot is left unsold and remains the property of the owner. Having a piece "burned" (not sold) is a huge concern when deciding to put it up for auction, since it often puts a psychological damper on the market for the work. Buyer's Premium: A set rate that is paid in addition to the hammer price (see below) by the purchaser. Conditions of Business: The terms under wich the consignor and the auction house agree to sell the work to the purchaser. Read this carefully before bidding! Estimate: Before an auction, experts determine a low and high estimate of how much the work might sell for, establishing a range of value. This is included in the information that's available to the public before the auction as a preliminary guide. Guarantee Line: This is the most important information that's included about the work in the action catalogue including the authenticity, the name of the artist, details about the work itself, and the origin of the piece. Hammer price: The price the work was actually sold for. Lot: The individual object, or group of objects viewed as a single unit, that's up for auction. Lot Symbols: The catalog may have symbols next to the estimates that indicates further information about the lot. A key should be provided in the catalog or other literature provided by the auction house. Provenance: The history of ownership of the piece, ideally going back to its creation. Provenance is a very important factor in determining the piece's value in the auction market. Reserve (or Reserve Price): The reserve price is the confidentially agreed-upon minimum that the consignor and the auction house will sell a work. Unlike the estimates, the reserve is never publically disclosed. It must be set at or below the low estimate, and if bidding stops before the reserve is reached it won't actually be sold. Valuation: A detailed description of the work and its value. It is not the same as the estimate or the reserve, and is used primarily in dealings with charitable contributions, estate planning, and insurance. As the auction houses will tell you, many collectors want to sell artwork for one of the three D reasons - Death, Debt, and Divorce. In times of rising art market prices however, many collectors simply put work up for sale because they think they can make handsome profits. This contributes to the art world's secondary market - art that's put up for sale not by the artist, but by a collector or dealer who has bought the work in the past and now wants to resell it. Auction houses are one of the primary outlets for the secondary market. When an auction house aquires a piece, the first step is an appraisal, where the experts employed by the house examine the work and conducts their research to determine its value and create the estimates of what it may sell for at auction. Groups of works are then gathered together to create the auction. Every auction has a catalog featuring all of the lots in the sale with important information about each piece, and there is also a presale exhibition that goes on view for the public to come see the works in person before the auction. At the auction itself, each item is bid on one at a time. If the item does not have any bids, or if it never reaches the reserve price, it's bought-in. If it's sold, the winner of the item is responsible for the hammer price along with the buyer's premium and any taxes. The auction house takes a seller's commission, which is deducted from the hammer price, and the rest of the proceeds are given to the consignor. The condition of the piece: Works at an auction are almost always sold "as is," but the details of their condition are rarely disclosed in the catalog. Be sure to see it in person and, if it's difficult to tell on your own, talk to someone with the auction house for a full report on anything that may affect its value. You'll also want to research the artist of the piece, as their place in art history and the period that the piece represents has a huge impact on the work's value. Like buying a house, you'll want to research some comparables. Look up what similar works by the artist or from that period have sold for in the past. A good resource for this is Artnet's database. Once you have your range of what you'd be willing to bid in mind, you'll typically need to register for the auction. Then, come auction day, there are usually a few options for how to bid like in person, online, or over the phone. Look into the house's policies and protocols to be prepared. At the auction, the auctioneer will introduce each lot and start the bidding at a price lower than the reserve. As people begin bidding, they'll incrementally increase the price after every bid. If you're willing to pay that price, bid. If it goes above your maximum bid you're willing to pay, stop bidding. The auctioneer will continue to accept bids and increase the price until only one final bidder is left, and that person will win the item. If that person is you, the auction house will give you information on how to pay for the lot and transportation. This is a very interesting article. Please who is the writer?